I took advantage of the good weather to take a look at the Black-tailed Gull that had been seen in Tacoma. This is a very rare bird and is usually found on the other side of the Pacific. A gaggle of birders with scopes marked the best vantage point along Marine View drive to spot the gull. Unfortunately the sun was shining right on the log boom where the gull roosted along with a couple hundred other gulls. My birding partner, Tina, set up her scope and quickly found the bird. It was clearly an adult gull and had a black tail with just a smidgeon of white at the edge. The gonydeal angle was fairly straight. All characteristics of this gull. Later we showed the bird to a man from Vancouver who knew the bird very well from living in Asia. As the bird flew off into the sun, he confirmed our find. I did a life bird happy dance! I found some time in the morning to do a quick hike to a popular trail in the Issaquah Alps. There were a lot of families and youngsters about – glad to see them start young. The trail was short (1.8 miles) with a 200 foot gain and I was surprised how quickly I completed it. My pace was about 3.8 miles/hour. Not many wildflowers but there were a lot of Pacific Slope Flycatchers calling. 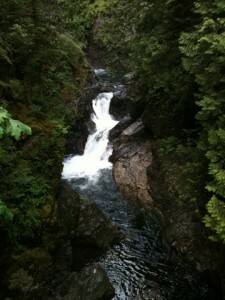 I made my 2nd hike of the season to Twin Falls outside of Northbend. The trail is very well maintained, 2.25 miles roundtrip with an elevation gain of 500. It took me about an hour to hike. The trail was very green and lush with the forbidding oploplanax horridus loitering near the trail. The wildflowers were few (dicentra formosa, geum macrophyllum) and the salmon berries were still not ripe despite the salmon berry bird (Swainson’s Thrush) singing all over the place. A Dipper perched on one of the rocky outcrops of the falls and a Hairy Woodpecker played ‘peek-a-boo’ with me as I descended from the falls.